The smallest of the Tranquility collection, this rustic house plan is perfect for the empty nesters or smaller family. This ranch floor plan boasts open spaces and outdoor living for a tranquil lifestyle. The timber trusses in the foyer and lodge room are the perfect example for how this cottage house plan brings nature indoors. The spacious vaulted lodge room features a wall of windows to allow an abundant amount of natural light. The large kitchen includes a bar area perfect for entertaining and opens to the rounded breakfast area. The master suite highlights a trey ceiling, large walk-in closet, and master bath with walk through shower. 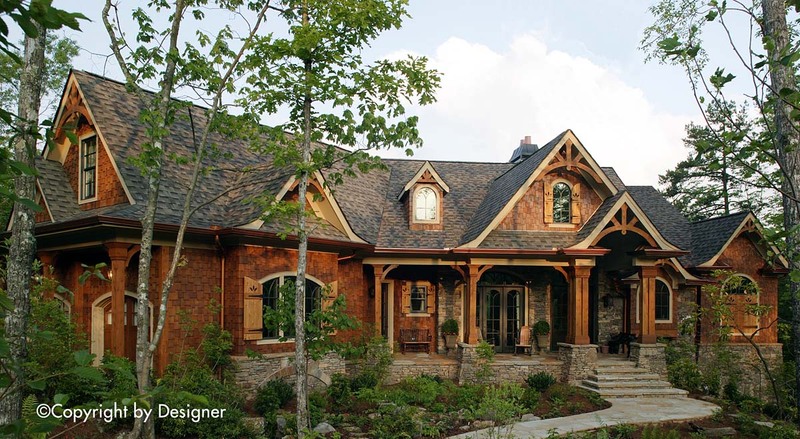 This mountain home plan allows for outdoor living at it finest. Featured on this plan is a covered porch with fireplace and rounded covered/open deck expanding the rear of this home plan. Two additional bedrooms round out this main floor. An option for a keeping room is included in the plans. 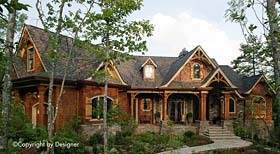 We offer floor plan modifications on all of our rustic mountain house plan designs. Question: There is something between the kitchen are and the Lodge Room. What is that and can it be removed? Answer: That is the refrigerator and a niche on each side. It can be moved. We would need to know where they would like to move the refrigerator? Question: The upper Windows are for the attic? Where is attic access?